Japanese dance crew , Wrecking Crew Orchestra got talent, Rock the floor in TRON-suit routine that is sure to make your day wow. This viral dance video shows you how LED lights with innovative control can amaze an audience. The song feature in the background is “Arena (2010 film)” from the Grammy Award-nominated soundtrack, “Tron: Legacy,”. It also features music from award winning DJ/producer, David Guetta, French electro house duo, Justice, Italian DJ/producers, Crookers and English dubstep DJ/producer, Flux Pavilion. 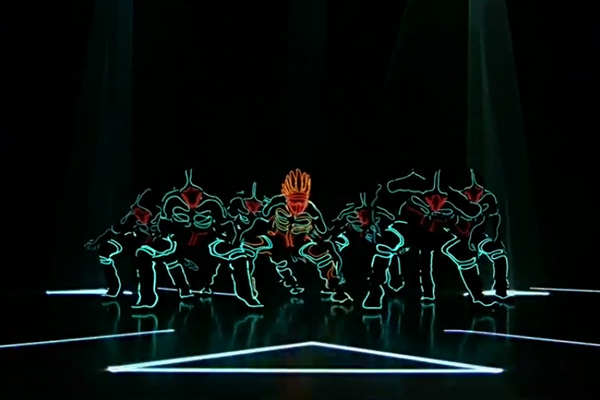 This eight-man dance team is able to control light, perform tricks and choreography without ever missing a beat. The wireless suits are controlled and the routine includes a mix of stop-motion animation, ripple effects and that leave that audience in wowing moment.